Musing of a Malcontent: Russia to the World: Your Oil Spills Are Like Baby Crying for its Mother. In a recent interview for Field & Crude, Mother Russia decided to show us all how it’s done when it comes to destroying the environment. “If you’re going to do it – do it big,” bragged Mother Russia from its exclusive estate in the Upper Volta. 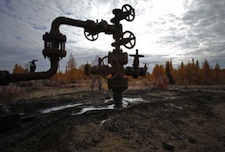 An article from the Associated Press states that about 5 million tons of oil is spilled every year in Russia. That works out to a Deepwater Horizon spill every two months. Almost half a million tons of that gets into rivers that flow into the Artic Ocean. Since most of the leaks are small many of them go unreported or unnoticed. In fact, leaks less than 8 tons are only considered “incidents” and do not have any penalties associated with them. Mother Russia would never agree to an interview. That’s the whole problem really. Russia doesn’t talk at all. They stay silent. How else could it have gotten so bad? 5 million tons a year? The number is ridiculous. All slowly seeping into the countryside, killing off vegetation and tainting waterways. Even the 5 million figure is likely an understatement, given how little oversight there is throughout the country. The Russian Economic Development Ministry estimated in a report last year that it was likely more like 20 million tons a year. And I thought BP was bad. Russia makes BP look like Greenpeace. Look at this way. The US, the third largest oil producer, reported 341 pipeline ruptures in 2010 with about 17,600 tons of oil spilled. Canada’s Transport Safety Board reported 11 ruptures in the same year with about 7,700 tons spilled. Nigeria logged 110,000 tons spilled in 2009, much of that due to attacks by rebels in the country – so you gotta cut them a little slack. Russia reported 18,000 pipeline ruptures. And with the 18,000 figure, no real answers or reasons as to why it is such a high number. Irate Cossacks roaming the Gulag Archipelago sabotaging oil lines? Mmm – not likely. Confusion as to the effects of crude oil on the environment? If they can build a nuclear plant I am fairly sure they know all about that wacky oil substance and its effects on nature. The lure of money and all that that entails? Now we’re getting somewhere. A main issue seems to be technology and infrastructure. Pipes are broken. Bolts are leaking crude. Platforms are collapsing. In all areas of the system there is a general lack of integrity. There have even been leaks in newly built parts of the system. The whole thing has despair written all over it. This is fine if you are a Chekhov play – not so good if you are a herd of wild animals being killed off. Dr. Zhivago seems like a comedy in comparison. What makes all of this more unsettling is that there is a big push by several Russian oil companies to start drilling in the Arctic Circle, in places like the Pechora Sea. Seems like there should be a rule that if you can’t take care of the toys you already have you should definitely not get brand shiny new ones – especially not ones that might cause irreversible damage to the environment. You don’t get the GI Joe with kung-fu grip without showing you are worthy. Or a Malibu Barbie with adjoining Beach House. This should just be the way of things. So what’s in store for Mother Russia in 2012? Doubling the pollution poring into Siberia’s Lake Baikal! You know – the one that holds 1/5th of the world’s supply of fresh water? That’s right! Plans are already underway so the goal is totally attainable. Mother Russia really knows now to take on the environment! Go Russia! !